 Quad Core processor (less than 15 users) / 8 Core processor (greater than 15 users). 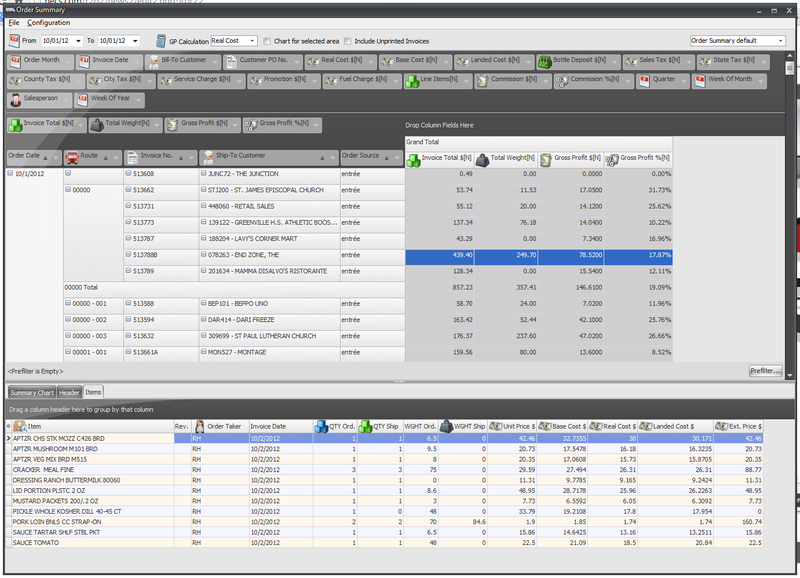 Note that the Sybase Advantage Database Server supports multiple processors on Windows. It is multi-threaded and will perform each user request database operation concurrently or in parallel if multiple processors are present.  For optimal speed, NECS recommends an enterprise class SSD (Solid State Drive) rather than a traditional hard drive with moving parts, such as the Samsung EVO series. Always perform regular daily backups and the SSD should be replaced when the manufacturer's warranty expires.  The entrée data files should not be installed on the terminal server. Instead they should live on a separate file server. In order for entrée V4 to run at optimal speed, please click here to run our System Optimizer tool. Not having the values specified from this tool will cause your entrée V4 system to run at a much slower than optimal speed. 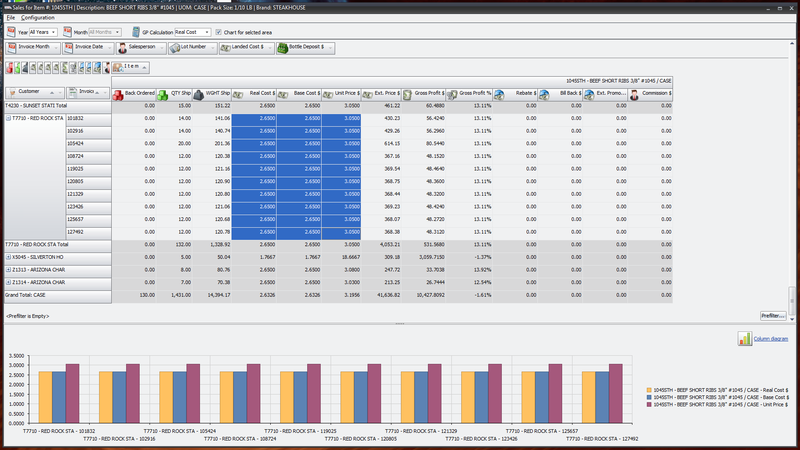 The dashboards in entrée are the ultimate tool for organizing and analyzing your business data. The actual term for our dashboards is called a "Pivot Grid" or "Pivot Table", which is commonly used in business intelligence software. The "pivot" design was created by Pito Salas, known as the "father of pivot tables". While working on a concept for a new program which would eventually become Lotus Improv, Salas realized that spreadsheets have patterns of data. A tool that could help the user recognize these patterns would help to build advanced data models quickly. With pivot tables, users could define and store sets of categories, then change views by dragging category names with the mouse. This core functionality would provide the model for pivot tables which we have embraced in entrée in our dashboards. It provides a highly flexible means for a food distributor to analyze and grasp trends from the mountains of complex data which is normally lost by simply printing reports. The dashboards allow you to visualize your data by summarizing into different charting styles including: pie charts, line charts, bar charts and area charts. 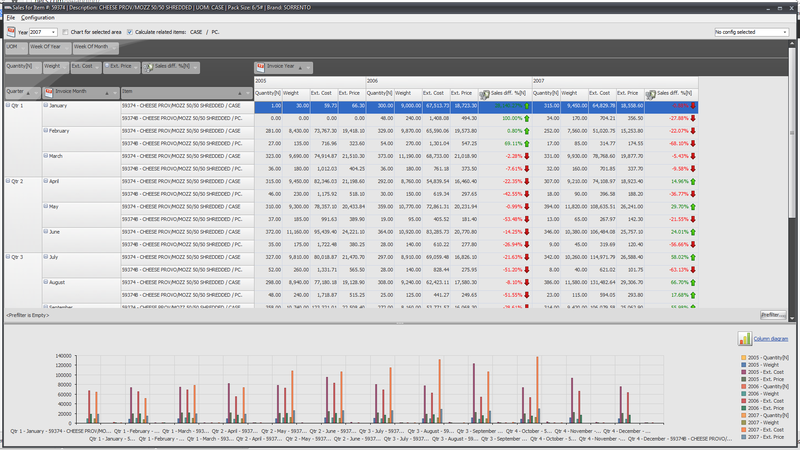 Dashboards are an interactive control, permitting you to easily reorganize the layout using drag-and-drop. As a result, your business data will be re-summarized according to the new layout of the column and row fields, so an end-user can easily alter a report to display the information they need in the way they need it. Custom dashboard configurations can be saved and loaded for sharing with other users in your company. The dashboards include full reporting capabilities, so you can easily print to paper or export to Excel, XML, PDF or HTML. Advanced data filtering is also provided for more sophisticated users. You will find the dashboards integrated into the Inventory, Customer, Vendor, Salesperson, Brand and Class File Maintenance options as well as on a special dashboard menu. Their main functionality is the ability to summarize large amounts of information and represent it in a cross-tabulated form. For instance, you can analyze sales during specific periods (years, quarterly intervals, months, weeks) for each customer, item, vendor, salesperson, brand or class. 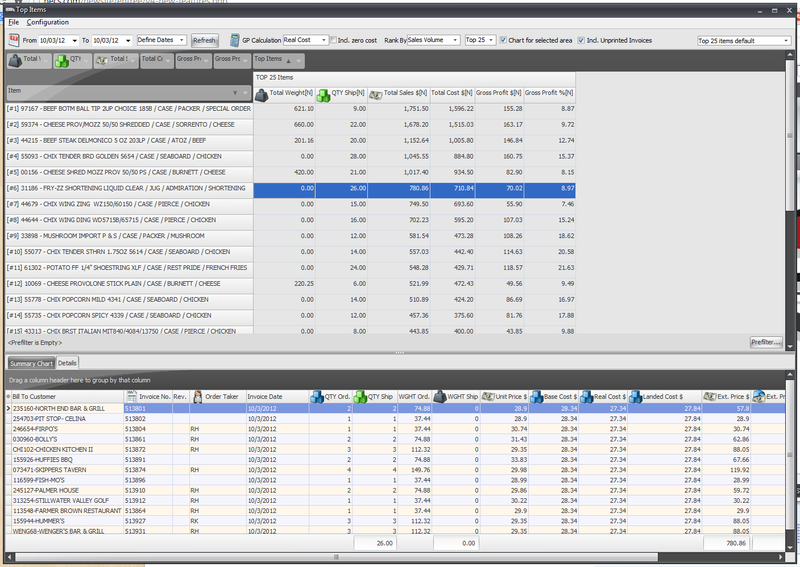 Also, many of the dashboards include "drill down" features which allow you to see specific information, such as all the line items of a selected invoice. An important dashboard feature is the ability to show "Top" Inventory, Customers, Salespeople, Brands, Classes, Routes, Vendors and Order Takers. You can select to see the top 5, 10, 25 or 50 of each category with multiple ranking options such as sales volume, gross profit dollars or gross profit percent. You can learn more about the Dashboards built into entrée by watching the 12-minute video presented by NECS President, Chris Anatra. Here the basics of using this powerful business intelligence tool are explained.